How to close a sales opportunity in Method. Closed Won: The sale is secured and a transaction takes place. Closed Lost: The customer chooses not to follow through with the purchase and no revenue is made. Note: While a closed won is preferable, logging lost opportunities at any stage of the pipeline can be helpful in determining why the sales opportunity failed, and what can be done to improve sales processes in the future. 1. 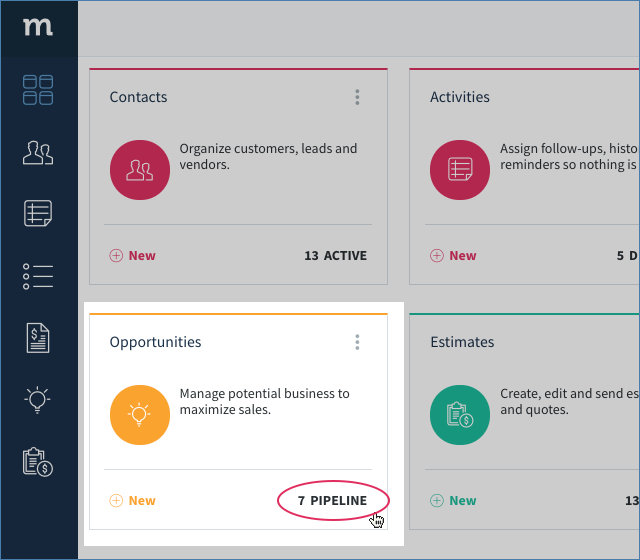 From your Method dashboard, click Pipeline on your Opportunities App. 2. This opens the Opportunities List. Locate the opportunity you wish to close and click on it. You can search manually or use the search function at the top of the screen. If your opportunity is not showing, check your filter view to make sure it isn't being filtered. 3. Selecting an opportunity in the grid opens it up in t he New / Edit Opportunity screen. Change the opportunity stage by choosing closed won or closed lost from the dropdown. Note: No matter which option you choose, the close date will automatically update to the current date. What happens when you Close an Opportunity? The probability percentage drops to zero. When you save the opportunity, it no longer appears in your active opportunities list (instead it can be found under Closed Opportunities and Closed Lost Opportunities). The pipeline amount is removed from the pipeline, updating both the Opportunity By Stage and Opportunity By User charts. The Conversion Ratio chart is also updated to reflect a new lost opportunity. The probability percentage rises to 100%. When you save the opportunity, if the associated contact is a lead, you are prompted to turn this lead into a customer. If you do so, that contact will be synced with QuickBooks and appear as a customer in Method. The opportunity no longer appears in your active opportunities list (it can be found under Closed Opportunities and Closed Won Opportunities). The pipeline amount is removed from the pipeline, updating both the Opportunity By Stage and Opportunity By User charts. The Conversion Ratio chart is also updated to reflect a new won opportunity. 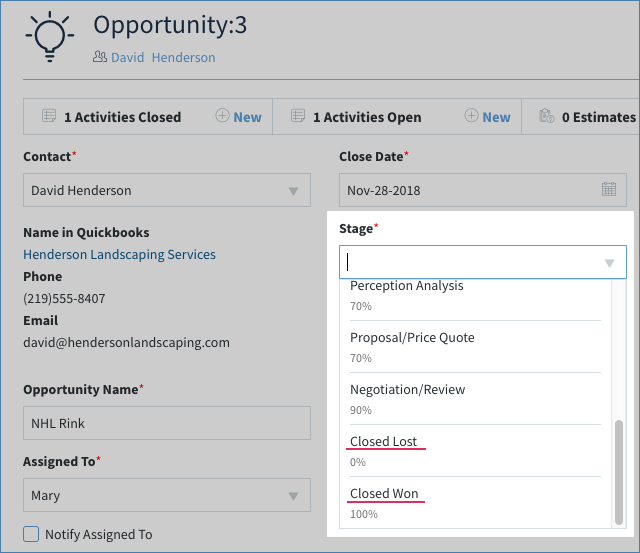 Or, if you have already created an estimate for this opportunity, you can convert that estimate to a sales order (if you are a QuickBooks Desktop user) or to an invoice.